Imagine getting a letter in the mail that details your voting history, your neighbor's voting history, and the history of other people who live on your block. That's what happened last week when the Ted Cruz campaign sent mailers entitled "Voter Violation" to households who have missed recent elections. This practice is something we call a "social pressure" tactic, one that encourages people to fit in and take part in something that their friends and neighbors are doing. Over the years it has proven to be effective in boosting voter turnout, though the Cruz campaign implemented it poorly (more on that in a moment). The concept of social pressure is very similar to that of "keeping up with the Joneses," which usually applies when people try to keep up with fitting in among their neighbors, usually for things such as what car one drives, where their kids go to college, and where people go on vacation. As it turns out, "keeping up with the Joneses" also applies to voting. Here's an example of how it works: a voter gets a letter in the mail that shows the voting history for her and her neighbors. She sees that her neighbors vote more often than she does, and the revelation could create a social pressure that compels her to vote in an upcoming election. People like to fit in. Some voters experience a bit of initial shock, because while it's true that we cast secret ballots, the general act of voting is a public record. And it works: social pressure methods have been tested, measured, and proven to be effective. Below are two examples of successful social pressure tests. During the 2014 election, Progress Texas launched an online social pressure experiment generating four million impressions on 250,000 progressive drop-off voters, those who vote in presidential years but not in gubernatorial years. These online ads were targeted to voters with a get-out-the-vote (GOTV) message and an element of social pressure that had a lighter touch: "remember, who you vote for is secret - but whether you vote is a public record. You and your neighbors can look up who voted after the election." Working with the Analyst Institute, an organization dedicated to testing and measuring the impact of various campaign tactics, we targeted voters statewide with the social pressure ad, and a subset of those voters saw a placebo ad that had nothing to do with politics. It had measurable impact: those who saw the GOTV ad participated at a rate of 34%, while voters in the control group who did not see the ad participated at a rate of 33%. An entire percentage point due to online social pressure ads. Similarly in 2006, a large-scale direct mail experiment was conducted among 180,000 Michigan households in which voters were sent mailers with a social pressure element that had a decidedly stronger approach: it listed the voter's name, along with the name of that person's neighbors, and their voting histories. The universe of households included control groups that did not get the mailer, so as to compare the impact of the mailer on those who did. 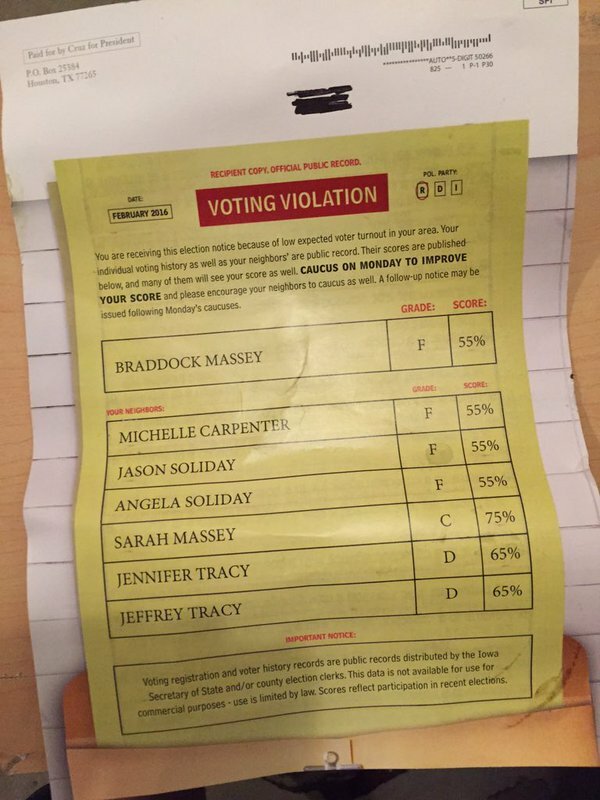 The result: households that received a social pressure mailer participated in the election at a rate of 8% points higher than those who did not receive the mailer. But while social pressure campaign tactics are proven to work - there is a catch: it is better for a social pressure effort to be conducted by an entity that is not on the ballot in an upcoming election. This is because some voters may be offended by the disclosure of their voting record, and while it may compel them to vote it may also compel them to retaliate against a candidate at the ballot box. It's better to leave the social pressure efforts to outside groups. The first problem with Cruz's mailer is that it came from the Cruz campaign in the first place (the Cruz campaign has confirmed the authenticity of the mailer). Attaching a candidate's name to the mailer can backfire if a voter is offended by the mailer and shows up to vote...for someone else. Just because social pressure methods work, it does not mean that voters like them. The second mistake the Cruz campaign made is that it went so far as to assign a letter grade to past voting records, and then claimed that one could "improve your score" by showing up to vote. These are steps too far, as there are no such thing as letter grades for voting, nor an ability to improve those imaginary letter grades by voting, or even a voter violation for not voting in the first place. 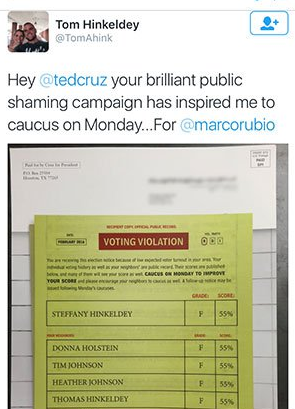 Compared to past social pressure efforts, the Cruz mailers are more along the lines of political intimidation. 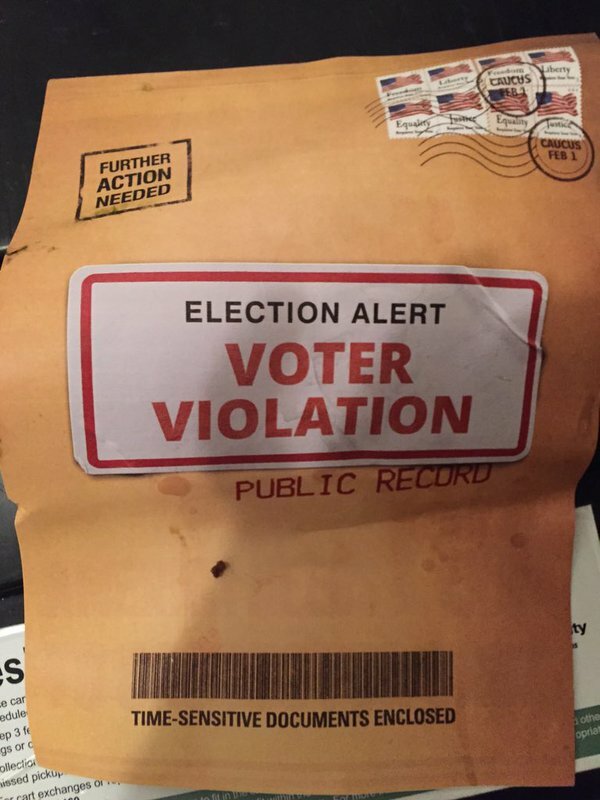 Iowa's Secretary of State says the mailer goes so far as to misrepresent state election law.